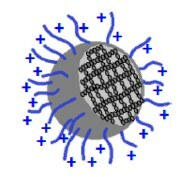 Artist view of PVCL-based microgel. L. Etchenausia, E. Deniau, A. Brûlet, J. Forcada and M. Save, Macromolecules (2018) sous presse. A series of reactive poly([2-(acryloyloxy)ethyl]trimethylammonium chloride) (P(AETAC)) cationic polymers with varying degrees of polymerization were synthesized by RAFT/MADIX polymerization and investigated as stabilizers for the emulsion polymerization of N-vinylcaprolactam (PVCL) in the presence of a cross-linker. It was demonstrated that the xanthate chain end of the cationic P(AETAC-X) polymers played a crucial role to produce stable cationic PVCL-based microgels at higher initial solids content (5–10 wt %) than usually reported for the synthesis of PVCL microgels. The thermoresponsive PVCL microgels with cationic shell undergo a reversible volume shrinkage upon heating in the absence of any hysteresis in accordance with the narrow particle size distribution. The values of the volume phase transition temperature ranged between 28 and 30 °C for the microgels synthesized using 4 and 8 wt % of P(AETAC-X) based on VCL. The presence of a cationic outer shell onto the microgels was evidenced by the positive values of the electrophoretic mobility. The swelling behavior of the thermoresponsive microgel particles can be tuned by playing on two synthesis variables which are the initial solids content and the content of P(AETAC-X) macro-RAFT stabilizer. Furthermore, the inner structure of the synthesized microgels was probed by transverse relaxation nuclear magnetic resonance (T2 NMR) and small-angle neutron scattering (SANS) measurements. The fit of T2 NMR data confirmed a core–shell morphology with different cross-linking density in PVCL microgels. Through the determination of the network mesh size, SANS was suitable to explain the increase of the values of the PVCL microgel swelling ratios by increasing the initial solids content of their synthesis.